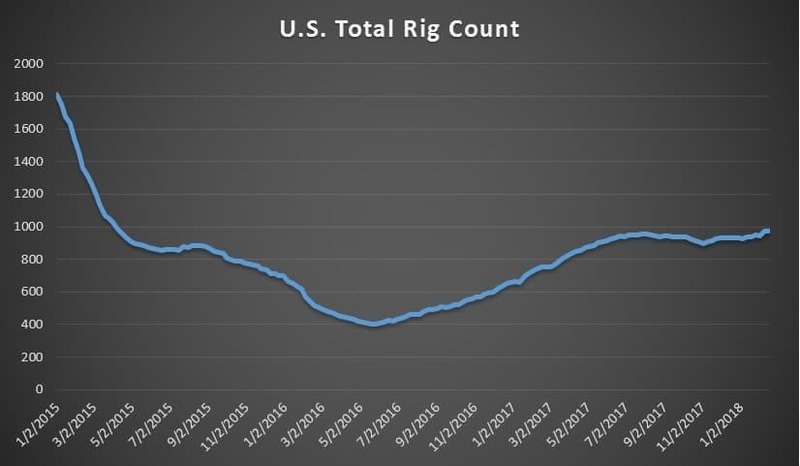 WTI received a boost at the start of the week as Cushing inventories have dwindled amid greater pipeline connections and reduced flows from Canada. Exports are also up. Meanwhile, Brent dipped as European refiners enter maintenance season. - The price of solar modules continues to fall, having dropped more than 40 percent since 2012. - The average module price in the U.S. stood at about $1.15 per watt in 2012, a figure that declined to $0.72/W by 2016, according to the EIA. 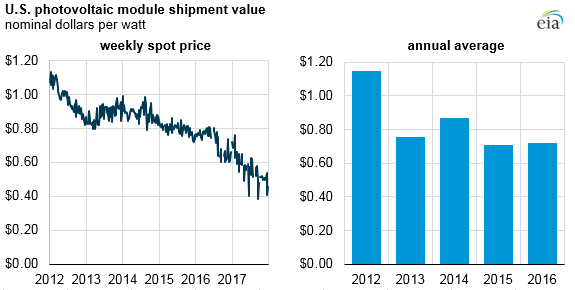 - By the end of 2017, the global spot price for monocrystalline solar modules fell to just $0.45/W. • ExxonMobil (NYSE: XOM), Total SA (NYSE: TOT), and Oil Search (OTCPK: OISHF) are poised to greenlight more than $6 billion towards and LNG export project in Papua New Guinea. • Eni’s (NYSE: E) profit surged in the fourth quarter, and 2017 production surged to a high of 1.82 million barrels of oil equivalent per day. Quarterly profits jumped to 2 billion euros, up from 1.3 billion euros a year earlier. • Hi-Crush Partners (NYSE: HCLP) reported earnings per share of $0.47, fourth quarter revenue of $216.5 million on sales of 2.985 million tons of frac sand. That compares to revenues of $167.6 million on sales of 2.456 million tons of sand a year earlier. Hedge funds slash bullish bets. 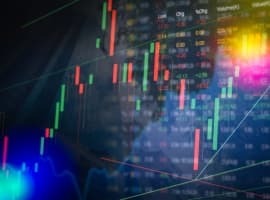 Hedge funds and other money managers reduced their bullish bets on crude oil in the second week of February, which coincided with a dip in oil prices. 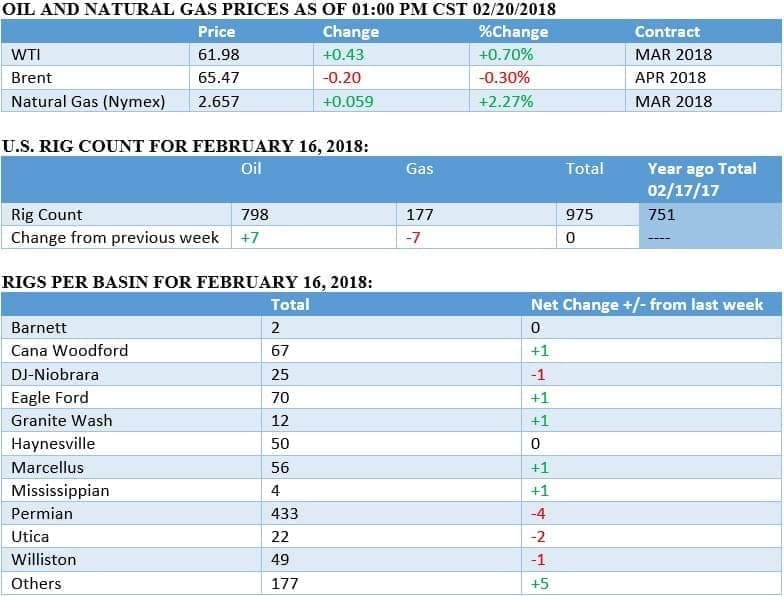 After building up a near record bullish position, investors “cut their combined net long position in the six most important petroleum futures and options contracts by the equivalent of 152 million barrels in the week to Feb. 13.,” according to Reuters. It was the largest reduction in nine months. With the retreat in prices and the liquidation of some of the long bets, there is now a more balanced positioning from hedge funds and other money managers, reducing the risk of a further price correction. Related: Is This The Answer To The Lithium Shortage? U.S. exports rise…so does WTI. WTI is receiving a boost relative to other benchmarks because of a spike in U.S. exports over the past year. New pipelines have better connected oil from Texas shale fields to the Gulf Coast, allowing more cargo to be shipped overseas. That, in turn, has helped drain stockpiles in Cushing, OK, helping to push up WTI. The American benchmark recently traded at a premium to the Dubai benchmark for the first time in over a year. Exports are likely to pick up after the start of operations at the LOOP export facility in Louisiana, which can handle very large crude carriers (VLCCs). Interior to hold largest offshore lease sale. The U.S. will hold its largest ever lease sale for offshore oil acreage in March. The Interior Department announced plans last Friday to auction off 77.3 million acres of offshore waters on March 21, spanning much of the Gulf of Mexico. Saudi IPO on hold until $70? Saudi Arabia is eyeing $70 per barrel before it launches its IPO of Saudi Aramco, according to Reuters. And top Saudi officials are not necessarily looking at today’s spot price, but the futures curve a year and two years out. For now, Brent is trading just above $60 for March 2019 futures. That suggests that Saudi Arabia will be price hawk, pressing OPEC and non-OPEC participants to keep the production cuts in place to tighten the oil market and drive up prices. 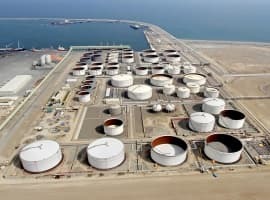 Saudi Arabia looks to nuclear to save oil for export. Saudi Arabia said it is in talks with 10 countries on the possibility of building nuclear reactors in the kingdom, and Saudi officials are eying plans for 16 reactors over 20 to 25 years at a cost of more than $80 billion. The idea would be to free up oil that is currently burned for electricity, allowing for more crude exports. However, the move would raise nonproliferation concerns and some U.S. officials have reservations about allowing Saudi Arabia to enrich uranium. China flooded U.S. with solar panels in late 2017. Ahead of expected tariffs from the Trump administration on foreign solar panels, a wave of solar panels flooded into the U.S. in the fourth quarter, according to Bloomberg New Energy Finance, much of it from China, but also from Mexico and Canada. As much as 5 gigawatts of solar are filed away in storage to be used for upcoming projects, a six-month supply. Plus, the U.S. tariffs do not apply to the first 2.5 GW of modules imported this year. All told, the solar industry did quite a bit of work to get around the tariffs. “The slow pace of D.C. bureaucracy has allowed the solar industry to insulate itself from the full impact of the tariffs,” Bromley said in an interview. “They won’t be as damaging as some in the industry have warned.” said Hugh Bromley, a solar analyst at Bloomberg New Energy Finance. Oil majors diversify into electricity. As the FT reports, several European oil majors are laying the groundwork to build up their portfolios in electricity generation, diversifying just a bit away from oil and gas as they prepare for a low-carbon future. Royal Dutch Shell (NYSE: RDS.A) announced plans to purchase First Utility, based in the UK. Shell also purchased Silicon Ranch Corp. last month, a U.S. solar company. Total (NYSE: TOT) is building up electricity generating assets in France. “Any piece of energy demand that can be electrified, needs to be electrified,” Maarten Wetselaar, head of Shell’s “new energy” strategy, told the FT.
Mexican oil company makes a play for Argentine shale. 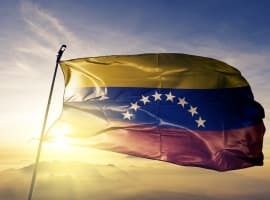 Vista Oil & Gas, an upstart company from Mexico, just paid $700 million for Petrolera Entre Lomas (Pelsa), which gives the company 27,500 barrels of oil equivalent per day in Argentina’s Vaca Muerta shale. Vista is led by Miguel Galuccio, the former head of YPF, the state-owned Argentine oil company. Vista got its start by raising $650 million from private equity, and it expects to drill first wells in the Vaca Muerta in the second half of 2018. Israel and Egypt move forward on gas deal. After months of talks, a deal is inching forward that would see Israel export natural gas to Egypt. Noble Energy (NYSE: NBL) and Delek Drilling (TLV: TMRP) said they will export 64 billion cubic meters of natural gas over 10 years to Dolphinus Holdings Ltd. of Egypt. The deal bolsters the export position of both countries, allowing Israeli gas to head to Egypt and also strengthening the case for Egypt to become a gas hub. Egypt as idle LNG export facilities that could be brought back into operation and it also is benefitting from the recent startup of Eni’s (NYSE: E) Zohr gas field. Some time ago I said in one of my comments that there is a real possibility that Saudi Arabia might decide to withdraw its IPO of Saudi Aramco altogether. Their own estimation is that the IPO will net them some $100 bn. But the recent anti-corruption drive has already netted them an estimated $106 bn according to Saudi official sources. Furthermore, eliminating the subsidies on water, electricity, gasoline and food will also save them some $100 bn and a peaceful settlement in Yemen would save them an additional $72 bn being the estimated cost of their involvement there. Saudi Aramco is the jewel in the crown in the Saudi oil industry. It is a world class company in terms of technology, global reach and proven reserves. Keeping it totally under Saudi ownership enables Saudi decision-makers to decide oil policy and the freedom of global investments without any foreign interference and without any risk of litigation by the United States.